When Phyllis Bandstra stepped up to the president’s role at Goodwill of the Southern Alleghenies in 1998, it was a $2 million-per-year, 70-employee operation with a handful of stores – ones that didn’t go far beyond what might be expected at any thrift shop. Under her leadership over the past 17 years, those numbers have changed dramatically, thanks to a focus on mission and a strategic, business-minded approach, she said. The store now is a $15 million-a-year agency with 270 employees, a 10,000-square-foot store in Richland Township and 93,000-square-foot warehouse to open possibilities for the future commercial endeavors. 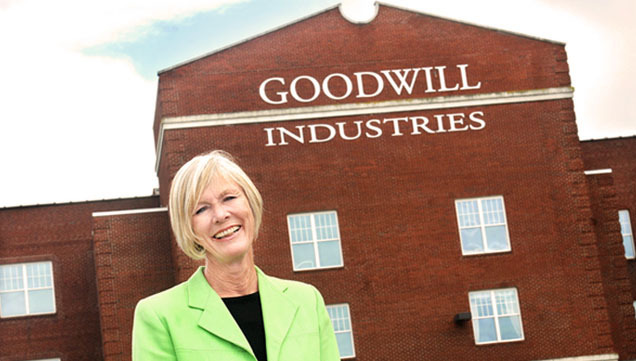 Bandstra is retiring this month as leader of Goodwill Industries. Phyllis Bandstra, president and CEO of Goodwill of the Southern Alleghenies, poses in front of the main office on Central Avenue in the Moxham section of Johnstown. Bandstra is retiring after 17 years with the company. The most important figures, Bandstra said, are the number of people affected. In 2014, the agency served more than 27,000 people through jobs-related programs. Those growth figures represent value, Goodwill board Chairman Mike Hruska said. As Bandstra, 64, looks back on the changes, she said her academic background in education prepared her to run a not-for-profit as a business, especially what she learned of curriculum development – essentially strategic plans. Though she found a classroom setting to be too structured, Bandstra enjoyed helping people. “I want to really do things, be able to vision what can be done, think about how we can do things better,” she said. “That education placed me into Goodwill with a very good background. After staying home to raise three children, Bandstra re-entered the workforce in the ‘90s, when she accepted a post at Mom’s House in Johnstown and then at Goodwill as director of employment and training in 1995. At the time, the agency’s services were exclusive to people with developmental disabilities and mental health issues. “I was looking throughout the area – with needs assessments, what other agencies were doing – and then my thought was that we needed to broaden from just working with people with disabilities,” she said. Soon after, monumental shifts unfolded: Goodwill expanded its service population to include unemployed and underemployed adults, dislocated workers and youth through a contract with the Southern Alleghenies Planning & Development Commission, and Bandstra was heavily involved in Goodwill’s Career Development Center, which opened in 1997. In 1998, when Amy Luttrell stepped down, board members chose Bandstra as the new president and CEO. Mike Kane, then board chairman, said Bandstra was a natural choice. “Phyllis is entrepreneurial,” he said. Continuing a business approach Luttrell had begun, Bandstra applied a strategy – a three-year plan updated annually – and made sure the organization kept its mission in mind as it grew. She upgraded store locations and added new ones as budgets allowed, and she worked with the community to understand employer needs with Goodwill’s first business advisory council. An important milestone was in 2009 when scores of people filled a parking lot and then parked along Eisenhower Boulevard to make the grand opening of the newly constructed 10,000-square-foot retail store. “The point was for us to make it simple, but elegant, and to deliver good services and products,” Bandstra said. Beside a business mindset, Bandstra said the organization will continue to grow – if it stays true to its purpose. “Because we have that mission to empower people to be self-sufficient through work, we never varied from that,” she said. “That’s what we’re about. That’s extremely important in running a company. We never really varied from our values, either, integrity and believing there is great value in every person and doing things right. We kept our eye on who we are. • Phyllis J. Bandstra joins Goodwill of the Southern Alleghenies in November 1995 as director of employment and training. • Goodwill expands its service population to include unemployed and underemployed adults, dislocated workers and youth through a contract with the Southern Alleghenies Planning & Development Commission and a placement program for people to find and retain employment. • Goodwill expands its service population to include welfare recipients through its first Welfare-to-Work Program, Single Point of Contact contract from the Southern Alleghenies Workforce Investment Board. • Bandstra is instrumental in starting Goodwill’s Career Development Center in 1997 after a needs assessment identified underserved populations. Bandstra also expanded job training services from solely individuals with physical disabilities to include people with disadvantaged economic conditions. • Goodwill’s directors’ board appoints Bandstra as president and chief executive officer in 1998. • Goodwill decentralizes donations processing from a single location and incorporates this job training into many of its larger Goodwill Retail Stores and Donations Centers. • Goodwill opens its a retail store and donations center in Ebensburg and in Huntingdon in 1999. • Goodwill opens its Northern Cambria Goodwill Retail Store and Donations Center in 2000. • Goodwill is named a Workforce Investment Act (WIA) Title 1 services for adults, dislocated workers, and youth in Cambria, Blair and Bedford counties. • Goodwill expands its service population to include youth with disabilities through a partnership with Intermediate Unit 8. • Goodwill opens its Somerset Goodwill Retail Store and Donations Center in 2002. • Goodwill opens its Bedford Goodwill Retail Store and Donations Center in 2003. • Goodwill purchases the CT Evans Building at 540 Central Ave. in mid-2000s in the Moxham section of Johnstown for administrative and workforce development staff. • Goodwill is awarded funding by the U.S. Department of Labor to begin operating YouthBuild® Johnstown, a program that enables at-risk youth to earn their GED certificates and earn wages as they rehabilitate or build low-income housing. • Goodwill becomes the first state-licensed psychiatric rehabilitation program in Central Pennsylvania and provides site-based psychiatric rehabilitation (based on Boston University Approach) through start-up funding from Cambria County MH/MR. • Goodwill is awarded funding by the PA Department of Public Welfare to operate Working Wardrobe Program (later renamed PA WORKWEAR) to provide unemployed people with proper attire for interviews, job training and first days on the new job. • Goodwill holds grand opening of its newly constructed 10,000-square-foot Richland Goodwill Retail Store and Donations Center along Eisenhower Boulevard in 2009. • Bandstra is appointed by Goodwill Industries International in June 2012 as a first-term three-year member to its Goodwill Executive Council. • Goodwill purchases a 93,000-square-foot warehouse in Paint Township in 2014 for the Goodwill Industries Centre for Social Enterprises. • Goodwill opens a Latrobe Goodwill Retail Store and Donations Center in April 2015.